L to R: Participants Fred Onyango (ILRI), Daouda Dao (Centre Suisse de Recherches Scientifiques), Kristina Rösel (ILRI/Free University Berlin), Erastus Kang’ethe (University of Nairobi) and Saskia Hendrickx (ILRI), and facilitator Julius Nyangaga (International Institute for Rural Reconstruction). Participants not in picture: Delia Grace, Joseph Karugia and Amos Omore (all from ILRI) (photo credit: ILRI). 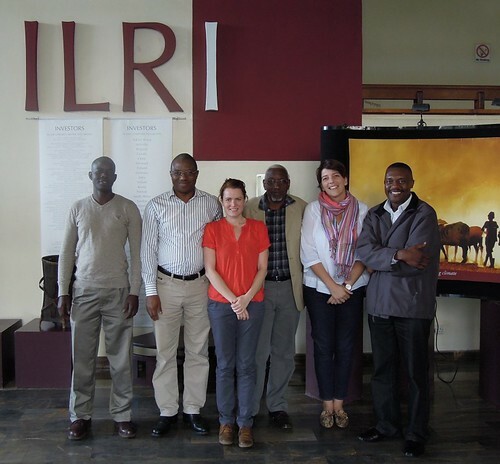 On 28-29 May 2012, Safe Food, Fair Food 2 held a workshop that brought together eight participants at the Nairobi campus of the International Livestock Research Institute (ILRI) to develop an Outcome Mapping strategy for the project. Present at the workshop were project partners from Centre Suisse de Recherches Scientifiques in Côte d’Ivoire, Free University of Berlin, the University of Nairobi and ILRI. Participants were introduced to the use of Outcome Mapping as a tool for engaging with policymakers and other stakeholders. During the group sessions, the vision of the project was translated into outcomes; project outputs and outcomes were defined, and stakeholders identified. These activities culminated in the development of a monitoring and evaluation strategy to track the identified outcomes with indicators. The two-day workshop was facilitated by Julius Nyangaga, Regional Monitoring and Evaluation Manager at the Africa regional office of the International Institute for Rural Reconstruction (IIRR). Outcome mapping tracks changes in the behaviour, relationships, actions, policies or practices of actors and which can be plausibly linked to the activities and outputs of a project. Conventionally, projects focus on outputs such as the number of people trained or the number of workshops held and so on, assuming that these would automatically lead to long-term and sustainable impacts. One of the main components of the Safe Food, Fair Food project is the engagement with regional economic communities in order to facilitate an open dialogue on food safety in informal markets to create a more enabling environment. Why is this dialogue necessary? 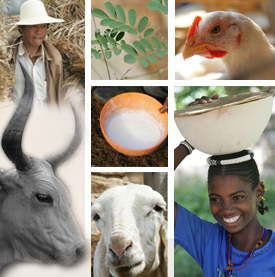 The existence of a huge food sector that largely escapes regulation and the massive burden of food-borne diseases in sub-Saharan Africa suggest that current food safety policy seems to be neither effective nor efficient. Moreover, there is a tendency to adopt international food quality standards and hazard-based regulations without considering local contexts. But how to deal with informal markets? Adopt a zero-risk/hazard based policy based on perceptions (‘If in doubt, keep it out’)? Is there an acceptable level of risk? Can participation improve food safety? Tags: meeting, monitoring and evaluation, Outcome Mapping. Bookmark the permalink.